Looking for a watch to use while running is sometimes a bit of a daunting task. There are so many different models and brands available on the market with their own unique features. Searching online and doing research for the best watches can quickly lead you down a rabbit hole that results in 42 open browser tabs and no solid decision being made. Luckily, we have found one of the best running watches we think is the best option for women: the Garmin Forerunner 35. Garmin is a very well-known name in the runnign watch market so we feel confident trusting them with our recommendation. Their service, support, and quality are at the top of the industry which makes them a fantastic choice for everyone from experienced runners to those who are just beginning their running journey. Here is a look at the Garmin Forerunner 35 and what makes it the best Garmin women’s watch for running. Yes, looking good while working out isn’t everyone’s number one priority but if you can get a great workout and look good doing it then that’s a big plus in our books. The Garmin Forerunner 35 watch is slim and sleek which allows it to do its job without getting in the way. The watch comes in different colors allowing you to add your own bit of personality to the look of the watch. Want something low key? Go with a black strap that perfectly blends with the black bezel of the watch and should pair with any workout outfit you have in your closet. Want something more bold and eye-catching? The green strap will do the trick. Most importantly, this watch isn’t a watch you would feel embarrassed wearing outside of the gym. It can be worn throughout the day which is perfect for those who want to track their steps and movement even when they aren’t working out. While you can wear the Garmin Forerunner 35 all day long, make no mistake: this wrist watch is made for tracking your workout. 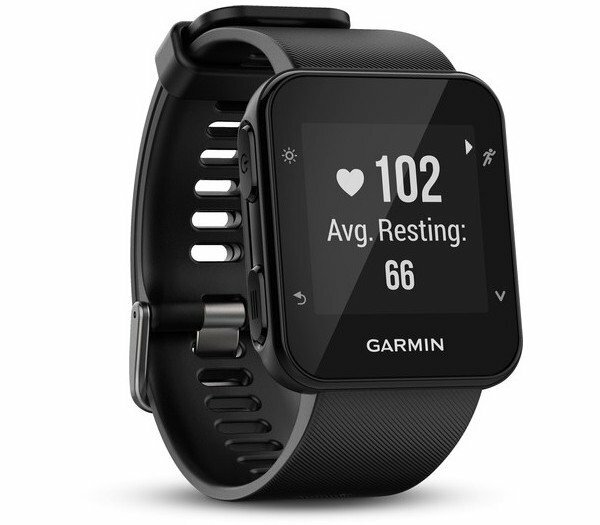 Garmin has packed a ton of features into this sleek watch such as a heart-rate monitor, pace monitor, activity tracking, and calorie burn monitoring that makes it the perfect companion for your fitness routine. Some wearables like to advertise their fitness tracking features which are often an addition to other features—the Garmin Forerunner 35 was built with fitness tracking as the main feature. With the Garmin Forerunner 35, you can go from one workout to the next without having to inform your watch that you are doing so. That’s a huge bonus when compared to other wearables that require you to set your workout before you actually begin. Go from walking to running seamlessly without having to worry about if your watch can keep up. The built-in GPS also puts this fitness tracker above much of the competition. The Garmin Forerunner 35 can easily determine your speed and distance traveled, which is perfect for tracking your workout and mapping your progress as you begin to run further and faster. The heart-rate monitor is another very nice addition. Some fitness trackers don’t have a built-in heart-rate monitor or require you to wear an additional chest strap. With the Garmin Forerunner 35, everything is built right into the sleek watch. No extra accessories required. All of these features add up to make for a great fitness tracking companion that can easily keep up with your workout. Most importantly, none of these features get in the way of getting your sweat on. No stopping to tell your watch what you’re going to do. Put on the watch and forget about it—just enjoy your workout. Of course, fitness tracking isn’t the only thing that the Garmin Forerunner 35 can do. It has several other useful features that make it a great companion whether you are working out or sitting at your desk. The Garmin Connect mobile app makes it easy to check your stats and share information with friends, family, or workout partners. 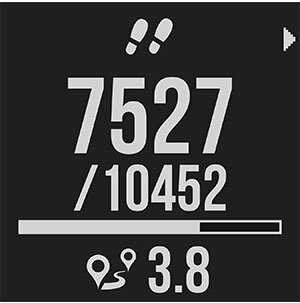 Break a daily record for steps? Share it with a friend and challenge them to do even better! People can also track your progress during your run as you work toward your personal best. 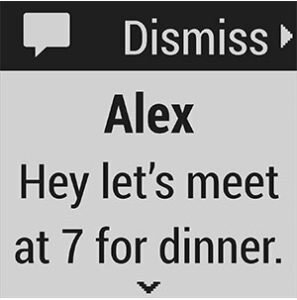 The social features built into this wristwatch make it an excellent choice for those who love to share. You can also stay connected with text messages and phone notifications displayed right on the watch face. Check messages with a glance to decide if the notification is important and requires your attention right away or if you can wait to reply. The customization options also make this perfect for whatever lifestyle you lead. Worried about sitting for too long and missing your step goal? Set vibration reminders to get up and move! Thinking about ordering dessert with dinner? Check on how many calories you have burned and see if dessert fits in with your goals! There are a ton of wearables vying for your attention and your money. If you want a watch that excels at fitness tracking while also being able to handle your notifications and daily activities then the Garmin Forerunner 35 is a fantastic choice. The price is reasonable and, when compared with the competition, the Forerunner 35 stands out. You can feel confident that this watch will be able to handle everything you throw it at it.